The Samoyed is a primitive breed of dog belonging to the Spitz or Northern dog group. An intelligent breed, known for its love of man and trademark smile, they take their name from the nomadic reindeer herders, the Samoyedic peoples of Siberia. Descending from a self domesticated breed, the Bjelkier (meaning "white dog that breeds white"), which made its home alongside the Samoyedic peoples thousands of years ago, the Samoyed would assist in hunting, protect the family, help with light sled work and keep the family warm in the chooms, tent like housing made from reindeer hides and saplings. Although primarily the Samoyed was a herding dog, used to herd and guard reindeer. The herding instinct is still alive in many modern Samoyeds today and despite appearances, they are a true working dog. Possibly the most iconic feature of the Samoyed is the glorious white double coat, however biscuit and cream are also acceptable colours. Much prized by the Samoyedic people, the white coated Samoyeds were at an advantage when hunting on the icy tundra. The coat is made up of a course longer hair, outer coat, and a shorter softer woolen undercoat. Their coat naturally repels dirt therefore frequent bathing is not necessary, however regular grooming is a must. The wool or undercoat of a Samoyed is typically shed once or twice a year, known commonly as "blowing coat". When this occurs, the wool can be easily combed out and kept for spinning or felting. An extremely warm fibre, Samoyed wool is reportedly up to 80% warmer than lambs wool and was used by the Samoyedic people to make clothes.. No other dog coat is quite like the Samoyed, and because of its low dander content, the Samoyed doesn't have the doggy odor prevalent in most other breeds and may be less likely to cause allergies. Samoyeds are often known to the general public for their work as sled dogs in both Arctic and Antarctic explorations. As the lead dog on Roald Amundsen’s expedition in 1911, a Samoyed is believed to be the first non-native creature to set foot (or paw) on the South Pole. 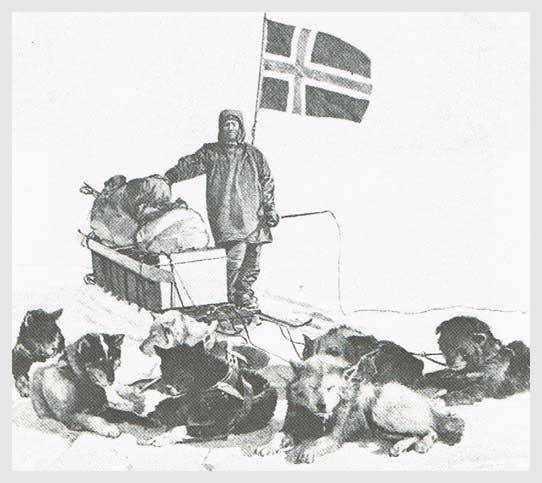 Many of our dogs today are direct descendants of the dogs from Amundsen's expedition. Unfortunately on many of these expeditions, countless dogs died due to misguided practices such as tail bobbing. The Samoyed tail in extreme conditions acts to warm and humidify air inhaled through the nose, therefore preventing pneumonia. On Captain Robert Scott's expedition to the Antarctic, all 33 Samoyeds died of pneumonia within 3 weeks due to tail bobbing. The six members of Scott's team hauled the remaining equipment to the South Pole, only to find Samoyed paw prints and a note from Amundsen from a month earlier. Beaten physically and emotionally Scott died on the way back. It was the Kilburn-Scotts that founded the first Samoyed Club in England 1909 and Mr Earnest Kilburn-Scott (of the Royal Zoological Society), was a big influencing factor in the breed. He had initially brought a puppy back to England as a present for his wife in 1880 after an expedition to Archangle, but later brought other dogs and puppies back from Siberia as well as dogs from the explorers. The first Samoyed was shown under it's own classification (rather than the "foreign class") in 1912. Originally the Samoyed was written as Samoyede, however the "e" was dropped in the UK in 1923. This lead to the beginning of the modern mispronunciation of "Sahm-oid" instead of the native pronunciation of Sahm-uh-yed.